Well, you create whatever parts don't already exist. If that happens to just be the "Earth" folder, then that's what you create. Will it be possible to fly more non-frictional spaceships in the final version. For example you have to start from earth and fly into a LEO and docking on your spaceship which is build for very long spacetrips. You have to do a swingby at jupiter for exapmle to incrase speed for your 3 years long Journey to pluto. Now you can take the landing module and explore plutos surface. Something like that would be cool. maverickxx, there is no gameplay planned which uses current or near-future tech. However, once the engine is completed and an SDK is available to other developers, it will be possible for other developers to create such a game if they want. However, an engine capable of - and purposefully built for - creating an entire procedural universe on an intergalactic scale would be overkill for a near-future space flight simulator. The only thing i wanted to know is if there will be near-future spaceships to be implemented without any hyperdrive features additional to the already implemented far - future spaceships. Skybox, impostors, FB, what do they mean? EDIT: Nm, they were working -- thought I had downloaded the 32k textures but just had 16. I'm looking to record some footage for a short film using this engine. The recording software I would be using is dxtory. But I cannot use footage with a user interface all over it. In Kerbal Space Program you can remove the UI by pressing a hotkey. I was wondering if there is such a functionality here? I've looked through user.cfg and there is nothing that will toggle the UI when in The Planetarium. Ctrl ~ to hide HUD, and press a tine circles on the toolbars to hide them. Also, try to use search next time. This question has been asked and answered a thousand times before. In the downloads section of the latest Space Engine version, there were a couple mirrors... but, what's the difference between the mirrors 1 and 2? Hi, I would like to know the answer to a question vanguardmook asked in chat but nobody replied. By the way, what happened to these types of planets? 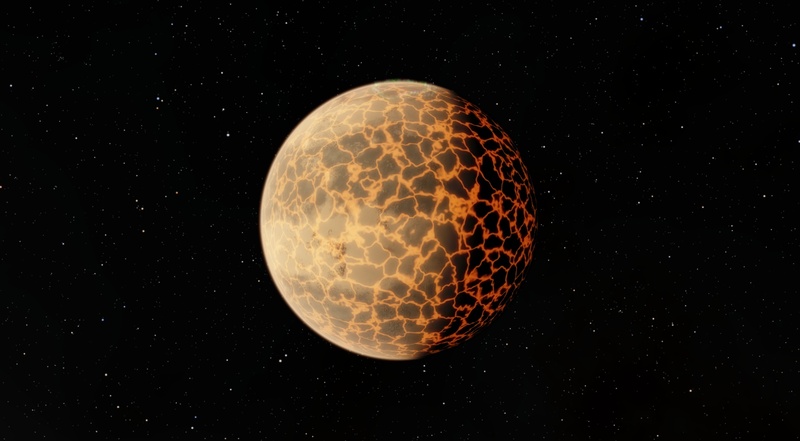 Do lava planets with fractured crusts exist in space engine? Do they or was it changed/removed? No difference. The mirror links are used just in case the main download link doesn't work. RockoRocks, they were changed and updated to be a bit more realistic. Those are very early WiP images. Thanks for posting my question, RockoRocks. I still kind of want to see those kinds of planets occasionally ingame, but I see how they would appear unrealistic. I noticed that the density of procedural stars in galaxies seems to be lower in 0.972 than in 0.971. Example, the Wiki lists the Milky Way as having just 72.231 billion stars, whereas 0.971 lists the MW as having 352.691 billion stars. Is this by design, or a result of changes as part of an ongoing WIP, or something else?